Christmas is almost here and it’s time to think about decorating your halls (or wherever you hold your parties) for this year’s holiday get-togethers. Christmas personalized koozies It doesn’t matter whether you’re going to serve traditional holiday drinks like spiced cider, spiked holiday punch, Irish coffee and hot cocoa, or more mainstream beverages like beer, wine and tea. 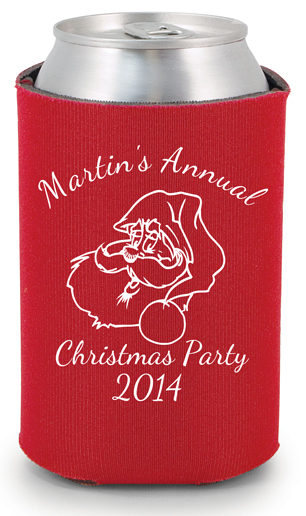 One of the easiest ways to make your Christmas party more festive is with personalized printed kooziesand can coolers, cups and mugs from Express Imprint. We have a huge selection of inexpensive, customizable beverage containers to choose from. Thermoform or plastic cups are perfect for cold drinks, and koozies in your choice of cloth, foam or faux leather are a must for the beer and soda drinkers (even more so if you’re in the South, the Southwest or California where Christmas parties often move outdoors). Our quality plastic and ceramic mugs are perfect for hot cider, cocoa and coffee (with alcohol or without), and bottle koozies are always a good choice for the water or wine drinkers. What will make your party really distinctive, though, is designing your own personalized imprint for the coolers, cups and mugs to turn them into decorations as well as beverage containers. The first part is easy: start with a red or green background color (there are many more available as well, if you’re feeling a little less traditional). Then add one of nearly two dozen Christmas or religious graphics – we have Santa's, holly, ornaments, candles, presents, angels, crosses, and a lot more to choose from. Then finish the design with your own personalized text whether it’s a personalized holiday greeting, the location and date of the party, the names of the hosts, or whatever else you’d like. We even have Jewish stars and menorahs you can put onto a blue or white cup, for Hanukkah celebrations. With imprinted beverage containers from Express Imprint, you’ll have beautiful and festive decorations circulating throughout the party all night, brightening the atmosphere and creating the mood you need for a successful holiday gathering. And the guests will have a wonderful keepsake from the party they can take home and use year-round - or put on their mantle or bring out every year as a Christmas decoration. The best part is that it will only take a few minutes to design and order your Personalized koozies, can coolers, mugs or cups, and our low prices will astound you. Our exclusive online design tool is so simple that even your mother (or grandmother) could figure it out in seconds; the entire process of choosing the perfect look for your koozies and cups, and placing your order, will take well under five minutes. And when you think about how much you’ll spend on holiday gifts this year (not to mention the cost of food and beverages for your Christmas party), it will cost next to nothing to spice up your party with beverage containers. Koozies and cups start as low as 39-40 cents apiece, and mugs are priced as low as 99 cents, complete with your custom imprint. Wouldn’t adding these beautiful decorative beverage containers to your party, and turning a silent night into a joyous one, be worth less a dollar a guest?